Heysan (heysan.com, mobile m.heysan.com) was another of the startups which demoed at the Mobile 2.0 Event. 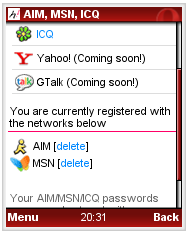 It’s a mobile web based IM client supporting AIM, MSN and ICQ – with support for GTalk and Yahoo IM “coming soon”. Features include the ability to use multiple services simultaneously, a single buddy list across all services, threaded conversation view and auto refresh. 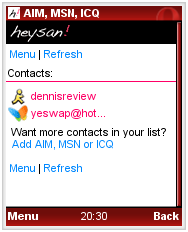 I’m not really much of an IM user but I wanted to get a feel for this service so I set up some accounts on AIM and MSN Messenger and played with Heysan a bit. I didn’t bother trying ICQ. Does anyone still use that service? Mobile IM (MIM) isn’t very popular compared with either SMS or desktop IM. According to M:Metrics only 6.3% of US mobile subscribers used MIM in May 2007 compared with 41.1% who sent an SMS. Heysan is trying to change that and is emphasizing their product’s easy of use compared with other mobile web IM platforms, the threaded conversation view and the ability to be logged into multiple services simultaneously. Heysan requires no registration to use, you just open the site and log in to one or more of your messaging services. Heysan remembers your logins so the next time you visit you are logged in automatically, a nice touch. I found the UI well laid out to minimize clicks, although that could be further improved with accesskey shortcuts for common functions like Write and Send. Unlike SMS which on most phones only lets you see one message at a time, Heysan’s threaded message view works like the threaded SMS on the iPhone, displaying a scrollable record of an entire conversation. Heysan seems like an one of the better mobile web IM clients. It’s similar to eBuddy. 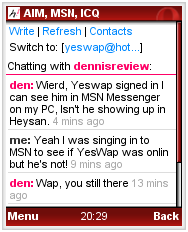 which also has a threaded message view and works on more networks including gTalk and Y!M. But eBuudy only lets you log onto one network at a time unlike Heysan. I had no trouble using Heysan with my phone’s built in browser and also with Opera Mini although auto refresh doesn’t work in Mini which is a limitation of Mini, not of Heysan. Although I’m a big believer in the mobile web, I’m not sold on the concept of mobile browser based IM. The biggest problem is that in order to be able receive messages your browser has to be open and camped on the Heysan site. Unless you have a smartphone with a browser supports that multiple windows, you can’t use the browser for anything else and you can’t really do much else with your phone either. MIM’s main (only) advantage over SMS is presence, meaning your can see if your contacts are online and willing to message. I think even that advantage will be short lived as mobile networks add presence to the core mobile services. Already services like Twitter provide mobile presence information in a simple low tech way. SMS has a huge advantage because it’s always available to receive a message plus there is a near universal client on almost every phone. For Mobile IM to be practical the MIM application needs to be able to run in the background, waking up when a message arrives. This generally requires a native application like IM+ , Fring or the Wireless Village client built in to many Nokia, Motorola and Sony Ericsson phones. If you can live with the limitations of a mobile web based IM client Heysan is probably your best choice. This entry was posted in IM, Site Reviews by Dennis Bournique. Bookmark the permalink.